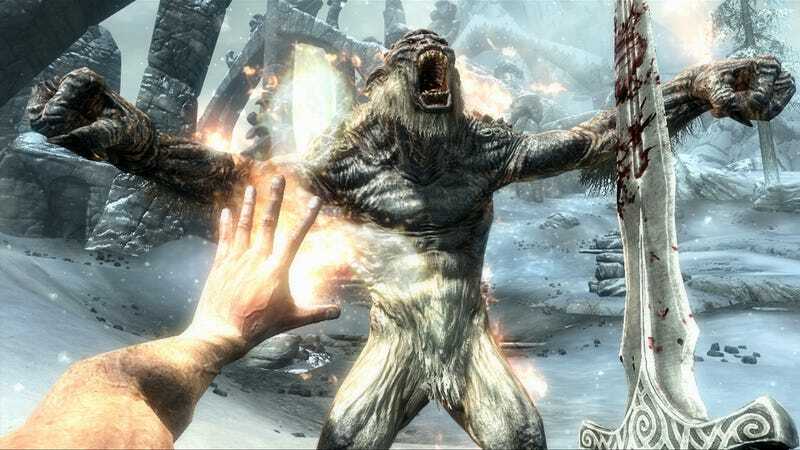 The Elder Scrolls V: Skyrim was a wonderful game on the PC and a fine game on the Xbox 360. On the PlayStation 3, however, it had issues for some players. Lag issues. Horrible, game-killing lag issues. Issues that made some Sony console owners shout that the game shouldn't be Game of the Year. What went wrong? And why have the game's developers at Bethesda struggled to fix it? "We did a ton more testing this time around, so the game is definitely our most solid release regardless of platform," Howard told me, building on what we had discussed prior to the game's release regarding the extra steps Bethesda was taking to squash the bugs common to the team's open-ended games. "The way our dynamic stuff and our scripting works, it's obvious it gets in situations where it taxes the PS3. And we felt we had a lot of it under control. But for certain users it literally depends on how they play the game, varied over a hundred hours and literally what spells they use. Did they go in this building? [And so on.]" One popular theory was that the lag on PS3 was due to a gamer's large save files. "No it's not," Howard said. "That's the common misconception. It's literally the things you've done in what order and what's running. Some of the things are literally what spells do you have hot-keyed? Because, as you switch to them, they handle memory differently." Howard said his developers knew that the PS3 was going to run into a "bad memory situation" and tried to tweak their code to prevent it from happening. He believes only "a small percentage" of gamers would have run into this issue, but it was enough for Bethesda to want to fix things post-release. "The 1.2 patch [released in November] took care of a lot of it," he said. Problem solved? Gamers all relieved and in the clear? Not after that 1.2 patch. "There were clearly people that weren't," he said. "We didn't know why. So they sent us their saved games." Gamers submitted save files throughout December and Bethesda pored over them, trying to find the situations that screwed up the PlayStation 3's memory usage. On the day Howard and I spoke, patch 1.4 was coming out, and Howard was hopeful that the work done using those save files would straighten the game out for more PS3 users. But he was also realistic about securing all the memory problems. The new patch, he told me, "takes care of those we have seen that are bad. So we're very confident a lot more people are going to be in a very good situation, but we're not … " He paused. "Now that we've been through this, we're not naïve enough to say, 'We have seen everything,' because we have to assume we haven't. There are still going to be some people who have to come back to us and say, 'Ok, my situation is this.' [Our response is:] 'OK, send us your saved game.' We literally need to look at what you have running. We tried doing it through e-mail. We need to open the saved game comes up and look at it. Wr've got one guy who has seven dragons on the other side of the world, and a siege about to happen in this city and another 20 quests running. And, ok, this is what the game is trying to do and it's having a hard time running that." They're working on it PS3, gamers. They thought they had it licked. Expect things to improve, one step at a time.